Emerson Creek Pottery was named for a creek in New England flowing by Emerson House, where the founders began making pottery. Uxbridge Massachusetts is home to Emerson Brook, which flows into the Blackstone River. Emerson Brook is mentioned in a 1732 text as a desirable stream running through town with desirable mill sites. An 1889 book “History of Worcester County, Massachusetts” (Duane Hamilton Hurd/J.W. Lewis & Company) offers: Emerson Brook moves southeasterly…until its confluence with the Blackstone, on the farm of Millins Emerson. 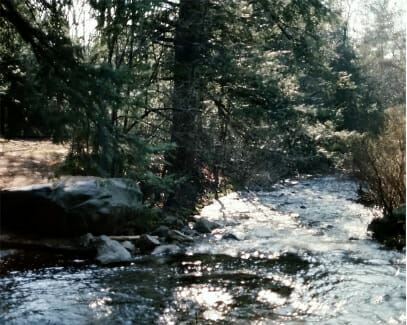 Its course is about five miles long, much of the way a very rapid, turbulent water, and has fall enough, if its water could be stored and used to advantage, to run all the machinery now in use in the town. It supplies the power for Lee’s Mills and the mills of Zadok A. Taft. It is one of the finest brook trouts in this section. Inspired by early American Cobalt decoration on stoneware pottery, early Emerson Creek Pottery featured simple monochromatic designs (Pine Tree, Single Iris) handpainted with a Sumi-e brush over porous glaze with a stoneware body. The firing techniques, designs and glazes have continued to evolve over the decades. Beginning with a small hand-built kiln in Massachusetts (1976) to a kiln made in Stoke-on-Trent England, the fire continues to meld clay, glaze and design into functional and beautiful pottery. All clay, glazes and paint hues are made on-site here in Virginia with formulas developed and tested over decades. Initial forms are hand-thrown and produced through slip-casting or pressing. Each piece is finished and glazed by hand.Designs are still hand-painted by artists who develop brush techniques to quickly capture the spirit of the complex natural environment. Sumi-e brush painting is a 2000 year old art form developed in Japan. Sumi-e means ‘black ink painting’. Early designs were one hue as Sumi-e implies. Over time, many colors and brush sizes have been added. Each artist who joins the team is trained in Emerson Creek techniques and develops their own style. You will find the artists’ initials on the base of each piece with our name and year. The potters moved from Massachusetts to Virginia in 1977 and built a pottery studio with wood timbered on site. Today the original studio is surrounded by several additions as the production and team have grown. 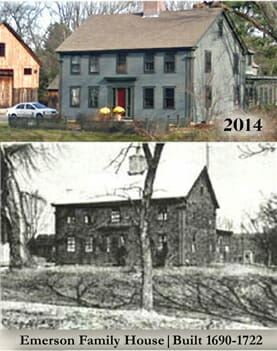 The property was home to the Wade Family, descended from Jeremiah Wade (1724-1772)who settled in Bedford County. The inventory of Jeremiah’s estate at death included one man’s hat, one old saddle, and one white horse. Jeremiah’s sons, Isaac Sr, Jacob and Joshua all served in the Revolutionary War; markers in a local cemetery honor the Wade Family’s service in the Revolutionary and Civil Wars. Isaac Sr. (1756-1823) had a son Jeremiah (1780-1849) who built the west section of this house in 1825. 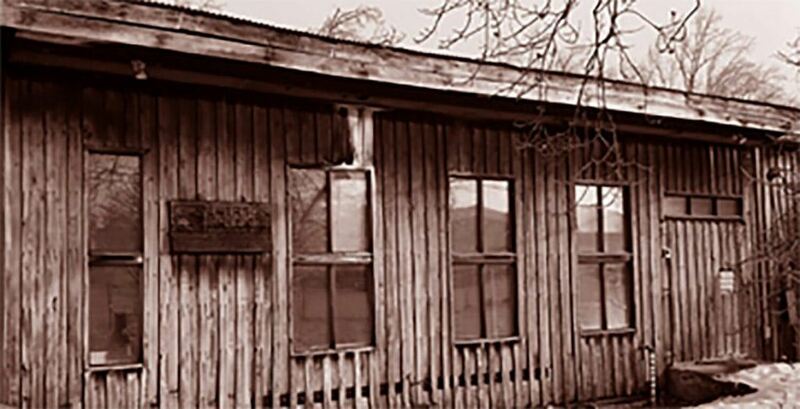 In 1862 Silas Wade (son of Jeremiah) purchased the estate of his father (for $1) on both sides of the South Fork of Falling Creek, the same on which said Jeremiah Wade resided at time of death. Silas Wade (1818-1894), a blacksmith and farmer, built the east addition. Silas’ son Pleasant Wade (1852-1930) and his children were the last Wades to own the property and live in the Wade House. In a land transfer record from 1881, Silas & Nancy Wade conveyed to Pleasant, 400 acres on the property he now resides, cattle, sheep, hogs, horses, wagon & harness, and one set of blacksmith’s tools with all my plantation tools of every description.In a 1922 land transfer, the property description mentions a “Wade’s Shop.” What is now Emerson Creek’s driveway used to be one of the primary roads in this area, known in 1864 as Shingle Block Road. Wade’s Shop was Silas Wade’s blacksmith shop, once located south of the house. The Wade House today is home to Emerson Creek’s Retail/Outlet Store. Original studio, built in 1977, still in use today. Our rural setting in Virginia and the Blue Ridge Mountains have inspired many designs, such as Dragonfly, Field of Iris, Dogwood, Summer Peaks, Lavender, American Blue, Go Green Earthware and Copper Clay. With humble beginnings in clay, a groundhog kiln and single potter’s wheel, today the pottery is home to a hardworking team who continue to create beautiful and functional work. From one historic house to another, from Emerson Brook to Falling Creek, American Made Pottery continues to be made at Emerson Creek Pottery. How is Emerson Creek Pottery Made? First, the clay is mixed using formulas developed over years of trials & tribulations! Next the clay is run through a pug-mill which kneads the clay and creates an even, smooth clay body for shaping. The prototype clay piece is thrown on a potter’s wheel. The clay is then pressed or poured into a form. The pressed or poured piece is finished by hand to smooth edges and eliminate imperfections. The form is dried until ready for glazing. The forms are either dipped or sprayed by hand in the glazing process. Many of our designs feature lustrous and earthy glazes which coordinate with painted designs. These glazes include American Blue, Go Green Earthware, Copper Clay, Onyx and Cream. The pottery travels to the decorating department where each piece is hand-painted, using a variety of Sumi-e brushes and color pigments. The pottery is then stacked in the kiln by hand, being careful to avoid damage. The kiln fires the pottery to 2000 degrees which hardens the clay body and melts the glaze into a lustrous finish. After firing and unloading the kiln, a final check is made for imperfections. Second quality pieces are taken to our Outlet Store and first quality pottery is placed in the warehouse ready for shipping.By the time you receive your pottery in the mail or take it home from our charming Retail Store, many hands have shaped your Emerson Creek Pottery. Each piece of our pottery is unique and reflects decades spent refining our work. 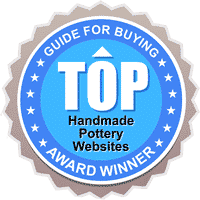 We are proud to continue the art of traditional American Pottery made entirely in Virginia. See how we make our ceramic mugs!